This beer garden changed ownership in 2013 and was formerly known as Münchner Haupt . Unfortunately, Gigi Pfundmair does not sing in the beer garden anymore. The Münchner Haupt’ is short for Königlich Privilegierte Hauptschützengesellschaft München (The Main Royal Privileged Marksmen Society Munich), which was founded in 1406. Since 1893, this club's headquarter is located on a large estate in Mittersendling. The Münchner Haupt' beer garden is next to the main building within this estate. 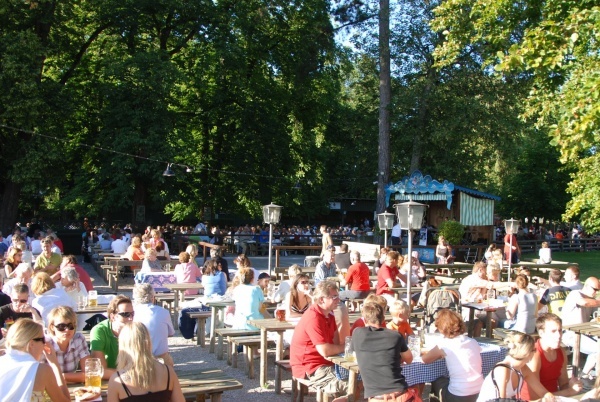 Older residents may remember the beer garden location simply by the name of Schießstätte (shooting range). The beer garden has 2,500 seats on old-fashioned wooden tables that are fixed to the ground. Guests can enjoy a beer in the sun while those who prefer will find a place in the shade below one of the large chestnut trees. Every Sunday from 5pm a Bavarian band performs on a small stage and guests are welcome to dance to the music. A unique feature of the beer garden is the singing landlady, Gigi Pfundmair, a professional opera singer who performs every second Thursday (inside the restaurant) and Sundays in the beer garden (depending on the weather). Beside theatre music, Gigi also sings Bavarian songs and Schlager (light pop tunes). The location has a castle-like atmosphere and the historical building with banquet hall is an ideal venue for special events for up to 300 guests. The food stalls concentrate on traditional Bavarian meals and snacks. The beer comes from Augustiner and a Maß Helles (lager) costs €7.60 (April 2018). The beer garden is open daily from noon until 11pm and can be reached by a short walk from Mittersendling S-Bahn station.